The table includes the cycles in the 1960s which is different from others. It’s important to get as much data as you can because even though this research goes back 53 years, there are only 8 data points to work with. It’s amazing how quickly the Fed went from agreeing with the Fed funds futures market to disagreeing with it. The Fed’s official guidance projected 2 hikes in 2019 up until its March 20th meeting. On the day of the press conference, the Fed funds futures market and the official guidance called for rates to stay in place for the rest of the year. It took just 2 days for that to change. There was just a short moment where the Fed was in tune with the market. This implies the Fed is being pushed into certain policy by the market, however, the Fed’s open mouth policy affects the futures market. Sometimes the dog wags the tail and sometimes the tail wags the dog. 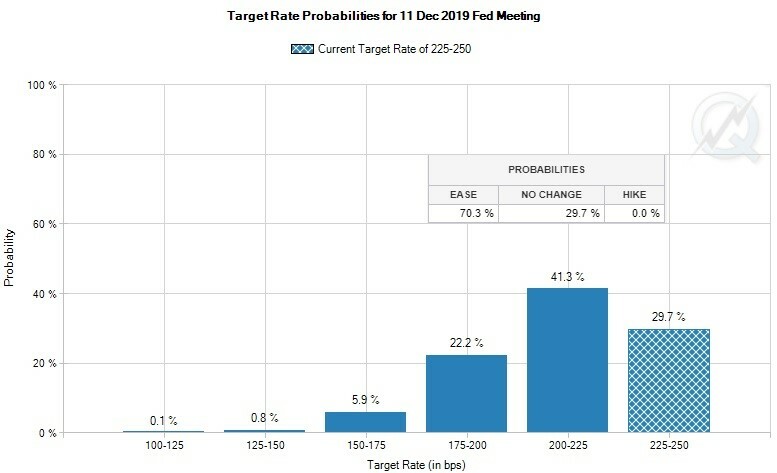 As you can see from the chart below, there is a 70.3% chance the Fed will cut rates at least once in 2019. The odds of a cut probably increased on Friday because of the weak Markit reports.